Its no big secret that I’m generally miserable. While my “new” job provides me everything that I’ve wanted in terms of food creativity, consistent menu changes, daily specials, and all the great perks of working for a corporate entity, I can’t help but feel like I will never be able to adapt. Currently my biggest hurdle is Mr. God’s Gift to Food (GGF for short). Working hand-in-hand with him is slowly but surely going to drive me insane. After having a mind numbing conversation with GGF I’ve been known to plaster a smile on my face, and go hide in the walk-in freezer for a few minutes just to cool down. But there’s a point here, I’ve need something to get my mind off all this. And time spent hiding in the freezer has inspired this….I bought a new, shiny toy to play with at my other job that no longer feels like a job. 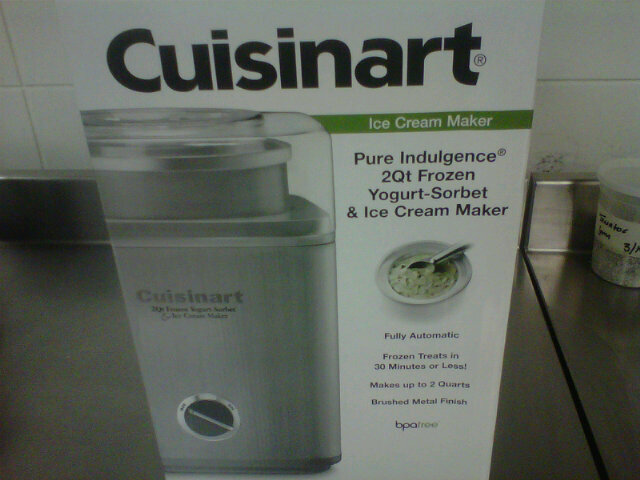 And with it I’ve acquired a new obsession for ice cream making. The best part of it is that I can finally have a real chocolate dessert available (my admitted weakness)….a brownie sundae with coffee scented chocolate stout ice cream.